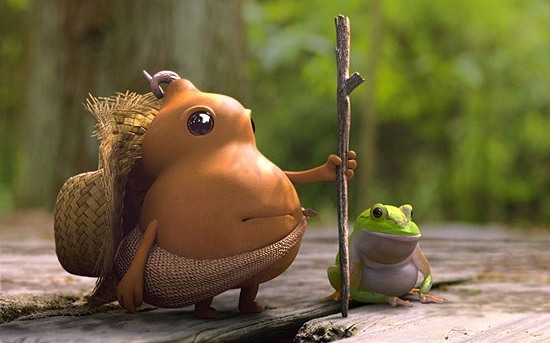 Based on the print advertising for the movie which featured a computer-animated gourd and a frog, I expected John Chu and Frankie Chung’s 2007 film, The Magic Gourd, to be an all-CGI affair. It is not. It’s basically Who Framed Roger Rabbit with CGI — at least in the sense that real-live human beings interact with animated characters or, in this case, computer generated ones. Based on a popular children’s novel by Tianyi, the movie centers on Wang Bo (Zhu Qilong), a lazy daydreamer who’s apparently the worst student in school. As luck would have it, he encounters the titular Magic Gourd (”Hulu” to his pals & voiced by Chen Peisi), a walking, talking Aladdin’s lamp with no limitation on the number of wishes he can grant. Wang Bo makes his wish, but gets a lot more than he bargained for in the process.